Niche and Goodgod bring the Tropical vibes to Sydney for one night only with DJ, Label Boss and Music Researcher Hugo Mendez, a founding member of the Sofrito crew who release essential 12”s and put on killer parties the world over. Their most recent release Kognokoura by Niama Makalou and the African Soul Band featured an exclsive vinyl only edit by Daphi (aka Caribou), pre-empting his exquisite 2012 release Jialong. Hugo Mendez’s DJ'ing style incorporates sounds, rhythms and influences from across the tropical music spectrum. A typical set from Mendez will feature vintage classics, exclusive dubplate versions and modern productions, creating an intense and vital energy that has seen him play clubs and festivals around the world. In his role as a researcher and compiler he has travelled extensively in order to produce groundbreaking compilations for such labels as Strut, Soundway, Jazzman and Nascente. The recent 'Sofrito: Tropical Discotheque' compilation for Strut Records was in the top ten albums of 2011 for Radio Nova and compilation of the year for Vibrations magazine and Radio Grenouille. Hugo also runs the highly respected Sofrito record label with Frankie Francis. The label releases everything from Nigerian acid boogie to raw Gwo Ka rhythms, futuristic sounds from new European producers like DrumTalk to heavy Latin sounds from the Pacific coast of Colombia. With this flawless output the label has gone far beyond the staid conventions of what constitutes 'world music' and in doing so has played an important role in broadening people's notions of this incredible music. Growing up in London he was immersed in both Latin and jazz music and the underground sounds of pirate radio - digging Tito Puente and Art Blakey at home before sneaking out to seminal clubs like the Blue Note, Club Labyrinth or a Jah Shaka session to soak in the sounds of '90s London. All of this laid a strong foundation for Mendez and lead to his distinct approach to being a DJ; an essential blend of UK club culture and tropical rhythms, underpinned by a commitment to bringing new and unheard sounds into European clubs. 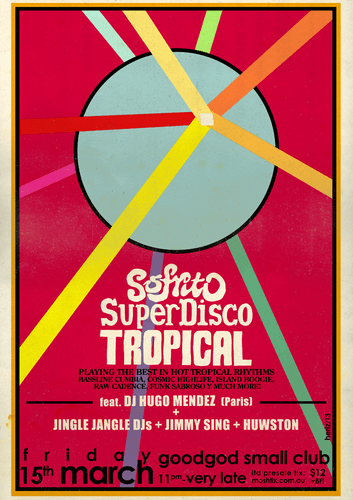 Joining Mendez on the night are Sydney’s own purveyors of tropical treats, Jingle Jangle, Jimmy Sing and Huwston. Don’t miss out on this very special late night engagement featuring some of the most exoctic sounds you’re likely to hear this year!